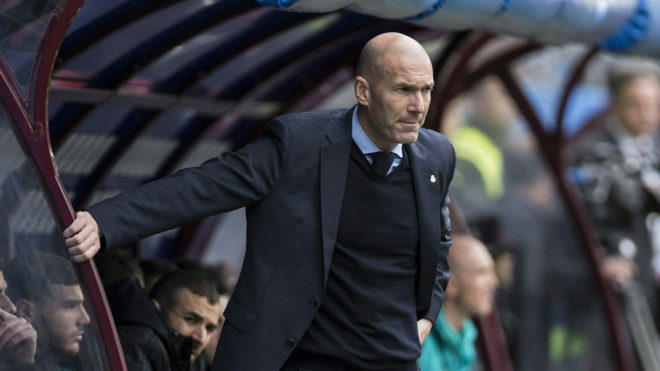 Eibar will be cursing their luck at losing 2-1 to Real Madrid on Saturday and it was a win Zinedine Zidane attributed to the otherworldly Cristiano Ronaldo. For the seventh game in a row, the winger scored and his brace at Estadio Ipurua provided three points despite Los Merengues being out of sorts. “[Ronaldo] is from another galaxy,” remarked Zidane post-match. “He knows he is going to score, he is unique and special. Isco and Gareth Bale came into the team to little great effect, leading to Zidane defending the duo while praising Luka Modric’s impact. “I thought they did well, but like the other players they suffered because we had difficulties and we weren’t good with the ball,” he added. “But they fought and they ran a lot, they had character like their teammates. Real are now four points clear of Valencia in the table as they look to guarantee a top-three finish, with Zidane determined to remain positive in the quest to catch Barcelona, who are 12 points ahead of his team. “This victory leaves me with a very special taste,” the coach said. “[Eibar] were better, they had a great game. It’s a tough place to go and they played well. “We knew that we were going to suffer and suffer. We had difficulties with the ball but we fought with character and got the win. “Until the end, the league is possible, and not only for us. “If you get distracted, you pay for it, so we must continue. If we want something, we have to win every game. With a week off, that next match is at home to Girona on Sunday week.